This page is written by the game's inventor, Ben Reiniger. This game is a favorite of its inventor. TessChess is my take on 4D chess. The idea for this game came out of dissatisfaction with V.R. Parton's Sphinx Chess. That game, and several other 4D (and even many 3D) variants lack the symmetry that is present in 2D chess. I am aware only of two 4D variants that have pieces moving symmetrically: Chesseract and Timeline (both can be found in the 4D category of this site). The former has some complicated rules, and the latter is perhaps not very chesslike. I hope TessChess and its variants help to fill this gap. I would like to thank Arlona Schulz for her help in inventing the game, and Joe Joyce for helping to playtest starting arrays and checkmate options. TessChess is played in a 4x4x4x4 hypercube. As is standard for 4D games, the board will be laid out as a 4x4 array of 4x4 chessboards. In this layout, the 4 dimensions can be called "small left/right", "small forward/backward", "big left/right", and "big forward/backward" (from a given player's perspective anyway). In visualizing moves, it is sometimes helpful to imagine stacking the small boards on top of each other, into a line of 3D boards: all valid moves in these 3D boards are valid in TessChess. The starting array is shown below. Other setups have been playtested, and this is the current favorite, but maybe a better one exists. In 4D chess, it is natural to have four basic sliders: these pieces change one, two, three, or all four of their coordinates by the same absolute value each move. They are referred to as orthogonal, diagonal, triagonal, and quadragonal sliders, respectively. Geometrically, that corresponds to moving through cells' cubic faces, square faces, edges, and vertices, respectively. In 4D, the orthogonal slider is rather weak, and the quadragonal slider is restricted to one of eight "bindings". In order to have piece strength relatively balanced, and to avoid having at least 8 quadragonal sliders per player, we will not use these elemental pieces, but rather combinations of them. The rook slides along orthogonals or triagonals. The bishop slides along diagonals or quadragonals. Note that the bishop is colorbound. The queen moves as a rook or bishop. The king steps one cell in any direction. The knight moves as a FIDE knight in any of the (axis-aligned) planes that it occupies. That is, it moves 2 squares in one direction plus 1 square in a another direction (not opposite the first), and no squares in either of the last two directions. The pawn moves without capturing one square in either of the two forward directions ("big" or "little"). It captures one square diagonally forward-sideways; that is, it makes one step in one of the two forward directions, and one step in one of the four non-forward directions (it never actually lands in the intermediate cell). To help in seeing piece movement, considering the individual orthogonal steps that make up a move often helps. For quick tricks, note that rooks and knights alternate colors in each step, and a king commands a 3x3x3x3 cube centered at his current location. 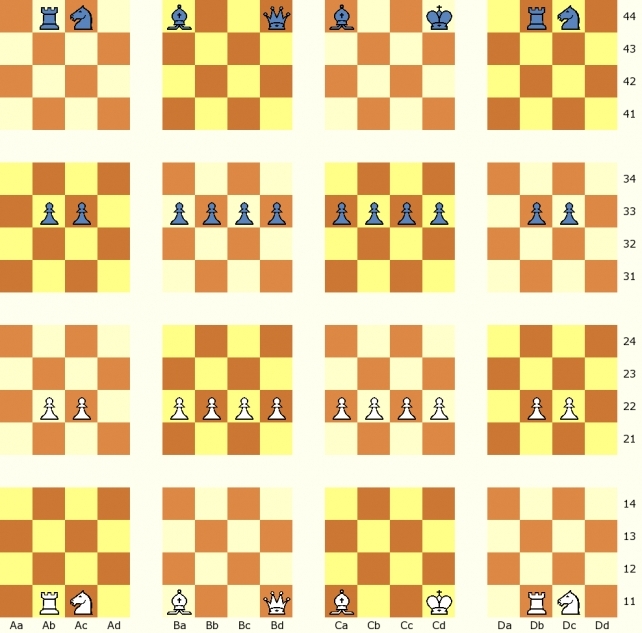 For longer-range moves, count how many squares separate the desired origin from target: for sliders, the nonzero numbers of squares in each direction must be equal, and for knights they must be exactly 0012. The pawns are more powerful here than one might at first expect. Be careful! While the king is extremely mobile, we have convinced ourselves that K+Q forces mate against lone K. To aid in checkmating, additional pawns for promotion material, or one of various additional rules, may be implemented. See the wikidot for a few of these ideas.